A few months ago, I was chosen as one of CT's most influential bloggers as part of Hartford Fashion week. As part of the interview, I was asked to choose my favorite wardrobe "essentials". Boy was that hard! Since I spend most of my time in worn-in jeans, that was a no brainer. I chose pieces that tell a story, such as my scarf from Italy as a symbol of my love for travel, a bold statement necklace from J. Crew in neon which expresses my colorful personality, and an edgy faux leather vest that layers well with any outfit combination. I shared my interview below; for the full interview, check it out here. 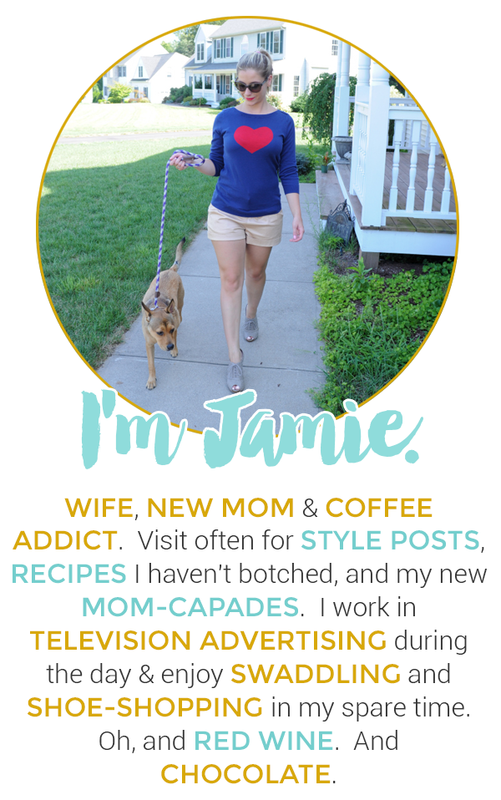 Jamie Taylor is a TV media professional at News 8 in New Haven, fashion blogger, wife, and new mom. My style is eclectic; I like to mix and match vintage and modern, high-end and modest pieces. While we were doing the shoot, you mentioned your love for travel and how it has played an influence on your style...which place has influenced your style the most? Italy and Mexico. I loved the architecture in Italy and visited Milan (the fashion capitol) and loved finding colorful pieces in Burano, Venice, and Rome. Mexico's colorful palate has also inspired me to try new colors and patterns. What is your most prized fashion piece? A bold statement necklace that has been passed down for 3 generations. My aunt had given it to my mom and my mom recently gave it to me. It's a gorgeous bold green color and really pops with a LBD (Little Black Dress). I have always loved fashion so I decided to share my personal style through my blog and just kind of ran with it! You've worked with Guess Watches, Gucci, Topshop... how did those opportunities come about? After starting my blog , I gained a lot of positive response from readers and these companies started to reach out to me to do collaborations with me & I delightfully accepted! What's next for your blog? Since my lifestyle has changed as I am now a new mom, I want to take my blog in a new direction to incorporate not only fashion, but also motherhood and family as well. Great essentials!! Love all of them! It would be great to read some posts about motherhood and new family life - always love those! Congrats on the award! I would have such a hard time picking my essentials too! I like what you selected. I have a similar leather vest that I love to toss on or nights out! It would be so difficult to pick a handful of essentials!! Love your shoes, anyway congrats for the interview.